Starring: George Clooney, Vera Farmiga, Anna Kendrick, Jason Bateman, J.K. Simmons, Sam Elliott, Zach Galifianakis, Danny McBride, Melanie Lynskey, Amy Morton. Director Jason Reitman’s follow-up to his award winning “Juno” is yet another commentary on modern life. This time, instead of teenage pregnancy, it’s corporate America. Ryan Bingham (George Clooney) loves his job. Unfortunately for other people, they lose their’s while he’s doing his. He’s a hatchet man and his duties consist of firing people from their employment and flying all over America to do so. His personal achievement being the collection of a vast amount of frequent flyer miles as he goes. He’s a man with very little attachments in life and no real connections with people. That is, until he meets the woman of his dreams (Vera Farmiga) on his travels just as his company decides to downsize and ground him. Forcing him to assess his life and himself. 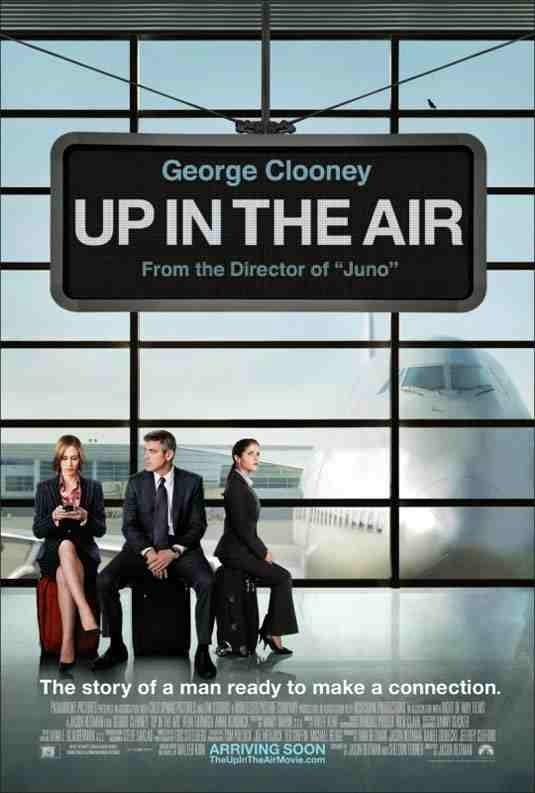 This film starts brilliantly with a great introduction to Clooney’s character and lifestyle but once the dust settles and Farmiga’s character is introduced, it becomes essentially a romantic comedy. I hoped for something more and despite some fabulous dialogue and performances, the film doesn’t really manage to break free from it’s romantic tendencies. All-be-it that it does things a little differently from the formula, I was still left dissapointed having heard such great things beforehand. This entry was posted on January 17, 2012 at 11:34 pm and is filed under Drama, Romance with tags 2009. You can follow any responses to this entry through the RSS 2.0 feed. You can leave a response, or trackback from your own site.